Once in a while, there comes a comic book so good that you really have to buy it. 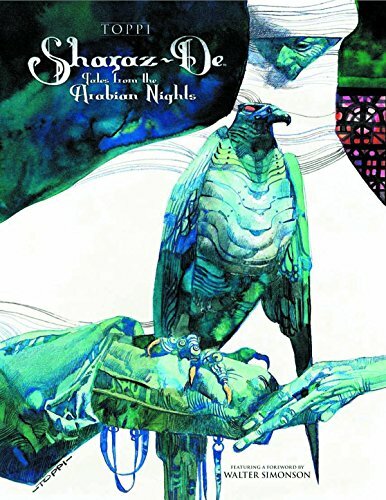 Sharaz-de: Tales from the Arabian Nights by Sergio Toppi is that book. Sergio Toppi was an Italian illustrator and comics author best known for his pen and ink line art. This comic book is an incredible showcase of Toppi's amazing pen and ink skills and techniques, and also his incredible sense of design. You can look at his art in two ways. One is just how well he draws them. The way he draws the lines, hatch them, or fill the blacks or create textures is just masterful. There are so many techniques you can gleam just by looking at each page. The other way to look is to study the way he designs his pages, the panels, composition and how he flows the stories. He is a master at using negative space and there are many examples of his strong design sense throughout. This is a book you can pick up anytime for inspiration. It's also a fantastic book for reference. And it can be a book to challenge yourself, to push yourself to the limits when it comes to drawing with pen and ink, and designing pages. While I don't read a lot of comic books, this book definitely is one of the best comic books around. Actually, it feels more appropriate to call it a graphic novel here. Oh yeah, the stories. The stories are selected tales from the Arabian Nights, aka One Thousand and One Nights, a collection of Middle Eastern folk tales compiled in Arabic during the Islamic Golden Age. These stories are of course translated in English here. And these stories are about evil spirits, treasures, risk, danger and treachery. It's a very good read, and it's coupled with insanely good art. I highly recommend this book, even to someone who doesn't like comics. You should buy it just for the art. While you can see a lot of pages from the book when you do a Google search online, having a book with all the pages, the stories is much more satisfying. More so when the artist is Sergio Toppi. It's really worth the money.